Here's another band I thought dropped of the face of the earth: Mos Generator. My last experience with them was 2012's Nomads. But the band continues to thrive as two more albums followed, Electric Mountain Majesty (2014) and Abyssinia (2016), and this despite a complete rhythm section change in between them. Drummer Jon Garrett and bassist Sean Booth joined founding vocalist, guitarist, and principal song writer Tony Reed. Now the power trio returns with Shadowlands, their sixth studio album. 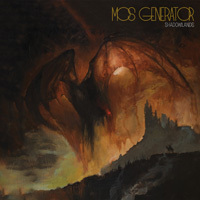 Shadowlands continues in the Mos Generator tradition, combining classic heavy rock with bits of classic heavy metal,psychedelic rock, and stoner rock. 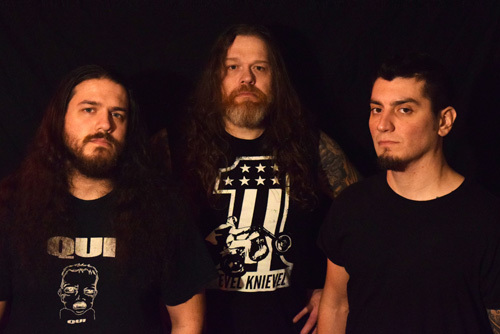 At the core is Reed's sharp riffage and spry guitar solos. His guitar work always seems fresh and inventive. His guitar lines follow traditional rock and metal styles, but can bend to psych and maybe even some jazz. Reed also has a distinct vocal presence, singing clean, strong, and easily following and adding to the melody and harmony within each song. Underneath and around Reed is a powerful rhythm section which delivers an ever present heavy rock groove. All these things work together for some interesting songs. For a pure riff monster with a thick bottom end, look to Woman Song. Sharp guitar work starts the heavy rock of Gamma Hydra, where Reed's voice is tuned to the rhythm and groove in the lyrics. At the midpoint, it breaks down to a foreboding tone with guitar over thick bass, before Reed rips into a killer solo. Some of his spry guitar work fills nearly the first half Stolen Ages. Then it builds with steady riffage, bass, and drums, before his voice appears and several solos finish the song. With Drowning In Your Loving Cup, Mos Generator moves into a classic, but heavier, melodic hard rock mode adding near AOR accessibility with fine melody, toe-tapping groove, and a catchy refrain. As said earlier, Shadowlands is genuine and consistent Mos Generator, delivering classic and melodic heavy rock with Tony Reed's fine voice and guitar leading the way. Get your groove on and get the album. Recommended. Shadowlands is genuine and consistent Mos Generator, delivering classic and melodic heavy rock with Tony Reed's fine voice and guitar leading the way. Get your groove on and get the album. Recommended.